Good morning lovelies! 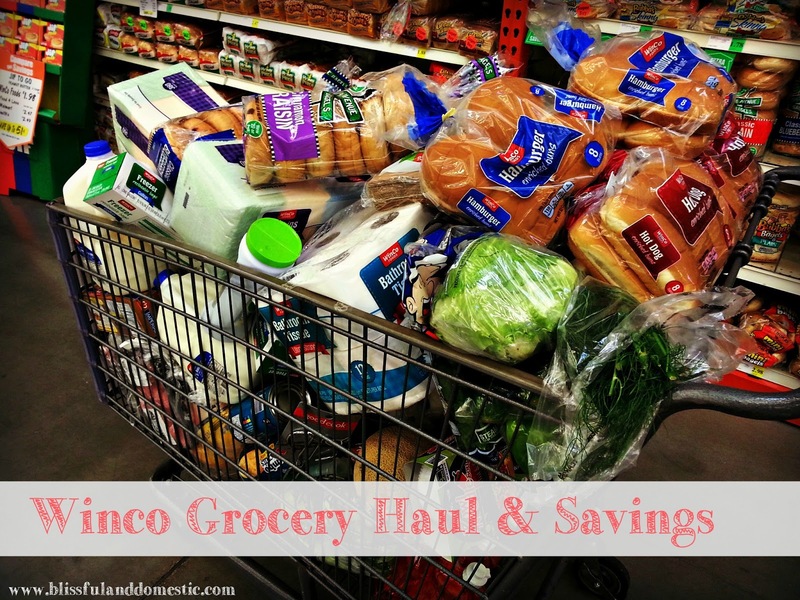 Today I wanted to share how my last grocery trip for this month went. I took this trip the first week of September. This month I ended up only going to Smith's for the case lot sale and to Winco. I had plans to go to Costco too, but the day I was shopping at Winco, it started pouring and I didn't feel like braving the rain enough to hit another store. I ended up getting my milk and sour cream from Winco and waiting on the rest till next month. Ready for the break down of what I bought? Bagels- I love to have a few of these stashed in the freezer for a quick morning breakfast. I'd love to be able to always make these homemade, but realistically I don't have the time. Because of that, I try to find these for under $2. This month I bought 3 packages of bagels. Napkins- these are such a sanity saver! Kids are messy and napkins save this mama a bit of stress from little messes. I buy the generic brand. I usually buy two packages at a time. One for the month and one as a backup in our pantry. This helps me to always have napkins in stock. I snagged these for $1.98 each. Plastic Baggies- I buy plastics bags every three months. I like to have them in sandwich size and gallon size. We use these for storing leftovers in the fridge and for storing bread. These are great to recycle. If a bag didn't hold raw meat, then I clean the bag and reuse it. I usually try to reuse a plastic bag two or three times. I clean them with regular dish soap and dry them on my drying rack. 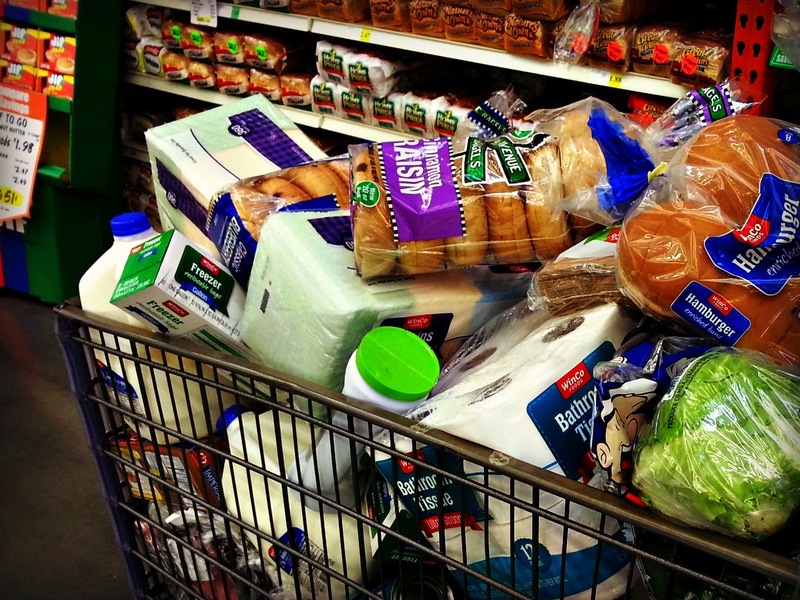 Reusing bags is a great way to stretch your grocery budget and recycle as well! I also have plastic Tupperware that I reuse as well for leftovers. I bought two gallon size boxes for $2.79 each. Each box holds 35 baggies. That means I will spend $1.86 per month on gallon size bags. Milk- This month I only had to buy 5 gallons of milk. I still had two gallons leftover from last month. Milk was $2.97 at Winco. I usually like to get it a bit less, but since I didn't want to continue shopping in the rain, when flash flood warnings were a go for my county, I decided to just get our milk from Winco this month. Frozen Blueberries and Strawberries- We had completely run out of frozen fruit. We use these in smoothies, muffins, on top of pancakes and waffles, or as a yummy snack. The kids love eating frozen blueberries. I buy frozen fruit every few months. A big bag will last us quite a while. These bags I scored for under $7 each! Frozen Chicken Tenders- I buy my chicken tenders or breasts in the bag. I try to buy only when the price makes it less than $1.99/lb. In general I don't want to pay over two dollars for any meat, no matter the type. This bag of chicken was $5.98. That makes the three pound bag of chicken $1.99 per pound. I only bought one bag, since I still had some chicken leftover from last month. Frozen Corn Dogs- Here is one of those things I buy to keep my family out of the drive thru. Sometimes I am tired or the day just gets away from me. When that happens, I like to have a few frozen options in the freezer to make dinner prep a bit easier. These corn dogs will last us about two months. At $9.98 for a box of 36, I will be spending just 28 cents per hot dog. For my family of four, we would eat 7 corn dogs at a meal and only spend $1.98. Add a fruit and you will be spending less than running down to your local golden arches when dinner doesn't turn out the way you want. Never under estimate having a few frozen items to help you on those crazy busy days. Vanilla Wafers- We haven't bought these in a while, but my kids are always asking for them. When I saw Winco had the generic brand for only $1.32 a box, I decided to get two boxes to surprise the kids. They were very excited! Frozen Steak Fries- These are a great item to have in your freezer. They make for a quick meal. Top cooked fries with chili and cheese for a yummy chili cheese fries meal or pair them with a yummy burger or hot dog and have a complete meal (don't forget to add a fruit or veggie too to make it well rounded). Margarine Sticks- I was running low on baking margarine, so bought a few to keep my stock up. Fall baking will be under way next month and I cannot wait! Refrigerator Crescents and Refrigerator Biscuits- I typically make these from scratch, but there is something about these store bought versions. They are delicious. I bought these and the biscuits as a treat for the family. They were excited. Frozen Tater Tots- We have been watching The Duggars on Netflix. In one of the episodes they talked about their yummy tater tot casserole. Keagan has been wanting to try it ever since. I bought these tots, so we could try it ourselves. It was really good! Frozen Fish Fillets- Since it was pouring outside and it was getting close to dinner time, I knew my family would be starving when we got home and put the groceries away. I grabbed a quick meal to keep the red head's tummies from making the whines come out. These were quick to make and we added some veggies and fruit to make it a meal. Hash Brown Patties- We love these with a Sunday breakfast. These hash brown patties are just like McDonald's, but cost half the price. I got a package of hash brown patties for 98 cents. There were 10 in the package. That makes each hash brown less than 10 cents a piece! Valencia Hot Sauce- Hubby is a hot sauce aficionado. He loves trying different hot sauces. He recently had some Valencia hot sauce at a church dinner and decided he needed some too. He is loving it! My man loves his hot sauce. Pickles- I've mentioned it before that the boys love pickles in our house. I bought another four jars to last the boys the month. Deli Meat- We were completely out of deli meat, so I bought two packs. They were each $3.98 each. I try to keep deli meat under $4/lb. If you combine coupons, than you will get even more savings! Chicken Fryer Two Pack- I love cooking chicken fryers in the crockpot. They are so yummy and we get a few dinners from the meat. Pork Stew Meat and Roast- There were quite a few pork roasts and pork stew meat on sale. I snagged a few to stock up my freezer. I was completely out of pork. This was not a planned purchase, but a pleasant surprise that I was able to fit into the budget. Kitchen Tongs- Mine broke and after hubby tried repairing them twice, I decided to pick up a pair. Noodle Bowls- These are Hubby's wish list item. I try to get him a few each month. He could eat these everyday, if our budget allowed. I ended up getting 50 cents off using my Checkout 51 app. Have you all tried that? It is pretty neat! Instant Jello (pistachio)- We love instant pudding. Chocolate is my favorite, while pistachio is Hubby's. I was originally going to stock up on this, but I put them back when I saw the pork on sale. I ended up only getting one box of pistachio for the Hubbs. I do this often if I see an unplanned sale, that my family needs to stock up on. I weigh it out in my head and see which deal I want more. This month I wanted the meat. I knew I could get pudding next month, so back on the shelf it went. Otter Pops- Hubby and the kids love these. They are a summer staple here in the 100+ heat. Eggs- 5 dozen- We love eggs and eat a lot of them. Five dozen lasts my family a little over a month. I also purchased a few toiletries as well on this shopping trip. We were running low on toilet paper, shampoo, and body wash. I bought a few of each in the store brand, Suave, and White Rain brands. They are the cheapest and fit the best into our small toiletry budget right now. I always buy the cheaper stuff for the kiddos to use (I'll have to share how we budget for this stuff in another post). I added both of my shopping totals for this month and then subtracted our toiletries and paper goods that I bought. How are you guys gearing up for a new month of shopping? I am planning to go this weekend. When you make the Duggar family recipe would you do a review? I've eyed that one before. thank you so much for sharing your savings.. It has really helped me.